Today we honor a local hero, Deputy Eric Overall. 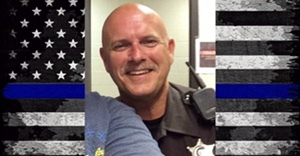 Oakland County Deputy Sheriff Eric Overall, age 50, was murdered on Thanksgiving morning by a suspect fleeing from police. Deputy Overall was recently married and has one adult son. He resided in Genesee County. Our thoughts and prayers are with the family of Deputy Eric Overall, both blood and blue. Godspeed, sir, we will take the watch from here. Thank you for your service. Deputy Overall, your life mattered.